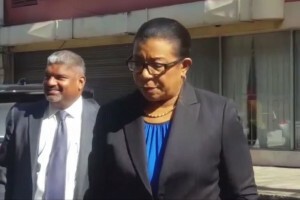 PORT OF SPAIN - Former attorney general Anand Ramlogan this morning made his first court appearance on charges of misbehavior in public office and obstruction of justice, and emerged saying he looked forward to hearing his accusers being cross-examined on the witness stand when the trial finally begins. Ramlogan, who was arrested at his home early Tuesday morning and slapped with the charges on Wednesday evening, was not required to plea to the indictable offences when he appeared before Magistrate Nanette Forde John. He remains on the same TT$750,000 (US$ 111,490) bail he was released on after being charged two days ago. The charges stem from claims by Police Complaint Authority (PCA) director David West that Ramlogan called him days before his appointment to the PCA and asked him to withdraw as a witness in a matter involving the then opposition Leader Dr Keith Rowley. Ramlogan has denied the allegation. And emerging from the Port of Spain Magistrates’ Court this morning after the case was adjourned to January 11 next year, he said he was looking forward to having the matter ventilated in court. “I anxiously await the day in court when the people that have made these spurious allegations will enter the witness box and subject themselves to the cross-examination that will prevail,” he said in a brief statement to reporters. Ramlogan added that he would also continue his law practice and would be back at work next Monday.